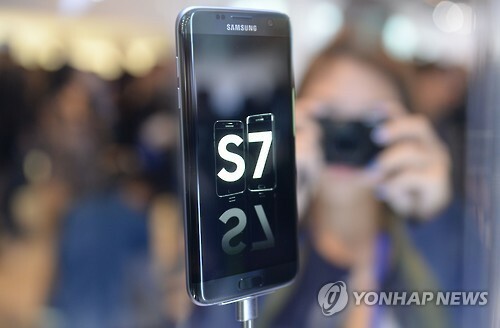 Samsung Electronics’ latest high-end smartphone, the Galaxy S7, on Wednesday earned the top rating by a leading U.S. magazine for its cameras and other features. “These new models aren’t just Samsung’s best smartphones, but, perhaps, the best smartphones. And they now sit atop our ratings,” said Consumer Reports. The magazine cited features such as cameras, water resistance and processors as the reason behind its favorable views. Battery life lasted more than 24 hours of simulated talk time, more than twice Apple’s iPhone 6s, according to the magazine. The Galaxy S7 edge, the Galaxy S7 offbeat version that is curved on both sides, ranked second in the review, which was the first since the models went on sale in South Korea two weeks ago. Consumer Reports also said it has ranked the iPhone 6s seventh and LG’s G4 fourth. The Galaxy S5 fell to second, the same rank as the S7 edge, ending two years of dominance in the ratings.